In a class that has traditionally seen little year-to-year activity, come this fall, all entries in the large-pickup segment will have been redesigned within the past four years. All, that is, except Toyota’s Tundra. Like many pickups, the tested Tundra — thanks in part to its optional TRD Off-Road Package — rides high for good ground clearance … and a tall step-in height. Unlike many, however, there’s no lower rear step to aid in climbing into the bed; you have to use the top of the rear bumper as a foot step. Although domestic makes dominate the large-pickup class and all its competitors are far newer, the Tundra has nonetheless had its fair share of success. Part of that no doubt hinges on the strength of the brand, but the truck itself also has several things going for it. 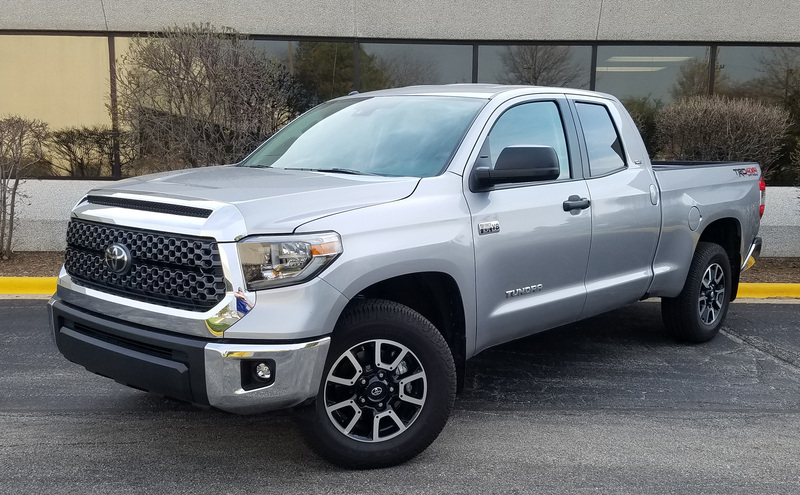 Last year we covered a higher-line Limited, and the Tundra changed little for 2018. But this time, we sampled a base-level SR5 in 4-wheel-drive Double Cab (extended cab) form. Although our tester started at a rather stiff $38,445 including the $1295 destination charge, keep in mind that it includes among its standard features a 5.7-liter V8 putting out a stout 381 horsepower, along with a tow package, Entune audio system with 7-inch touchscreen/CD player/satellite radio, and the Toyota Safety Sense P suite of high-tech safety features including forward collision warning with pedestrian detection, lane-departure warning, adaptive cruise control, and automatic high beams. Tundra features a sensible control layout, though some to the right of center are a long reach for the driver. But there are a couple of other features of the Tundra that stand out. One is the front-hinged rear doors, which are far more convenient than the rear-hinged doors found in some extended-cab models when trying to gain access in tight spaces. Also appreciated were the adjustable-height headlights, which help compensate for heavy loads in the bed. 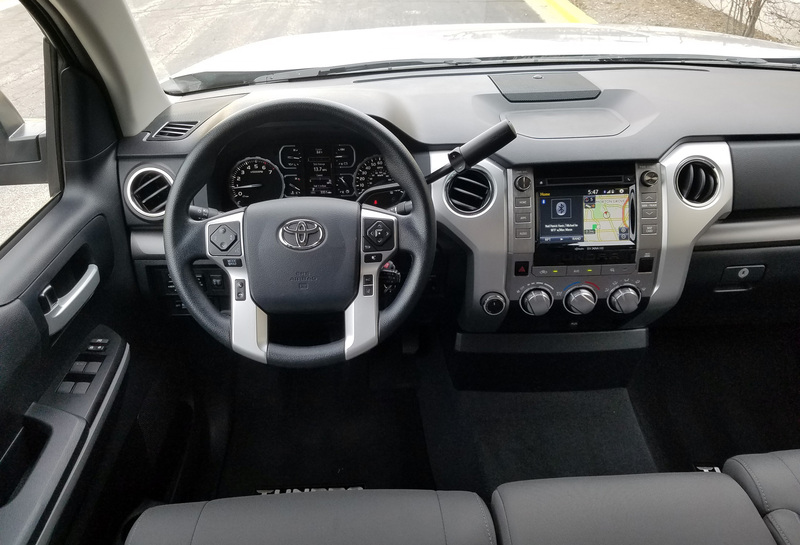 Thanks to an optional $525 Entune Premium Audio System, our tester also came with a navigation system, and the $2795 TRD Off-Road Package added unique 18-inch wheels with off-road-oriented tires, Bilstein shocks, engine and fuel tank skid plates, and LED headlights. Along with a $139 bed mat, it all resulted in a bottom line of $41,864 – sadly, not a lot for a large, extended-cab, V8-powered, 4WD pickup any more. As our tester didn’t include any form of running boards, its raised ride height resulted in a tall step-up into the cab, though all but the driver’s door included assist handles (the driver usually using the steering wheel for that purpose). In our bench-front-seat tester, the center seat cushion flipped up to reveal a handy storage bin. 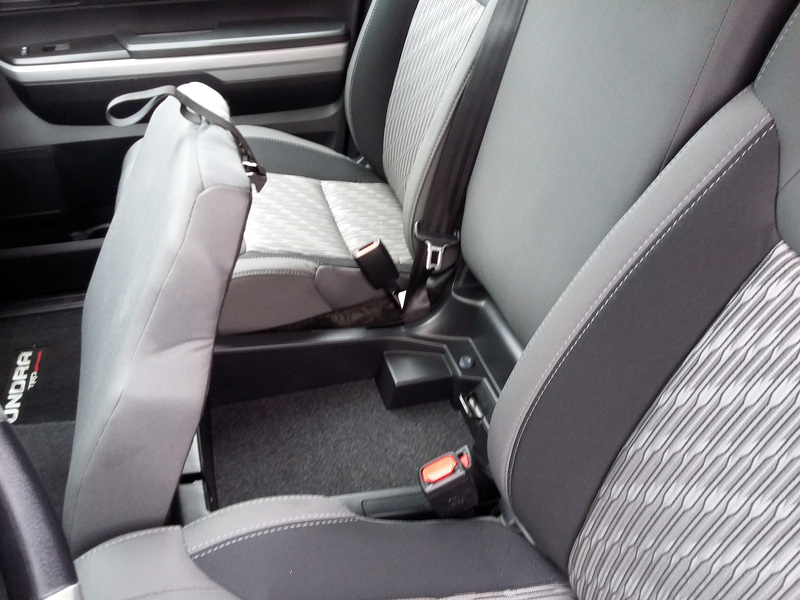 A low floor in front of that seat allows for decent center-seat foot space, giving the truck 6-passenger capacity. Once situated in front, a couple of things were noticed. First, visibility isn’t the best thanks to thick roof pillars – particularly the rear ones – the driver seat doesn’t offer any height adjustment, and the steering wheel tilts, but doesn’t telescope. But on the positive side, there’s good headroom and great legroom, audio controls include large volume and tuning knobs along with six physical buttons, and the climate controls consist of three easy-to-use rotary knobs. Note, however, that both audio and climate controls mounted at the far right are out of easy reach of the driver. Below the climate controls are two 12-volt sockets along with Aux and USB plugs. Our tester carried a front bench seat, with the center-seat cushion folding up to reveal a sizeable bin, and the backrest folding down to make a console box of sorts. Knee and foot space is sufficient in the middle for children at least, though the column-mounted shift lever might get in the way of a taller passenger’s knees. 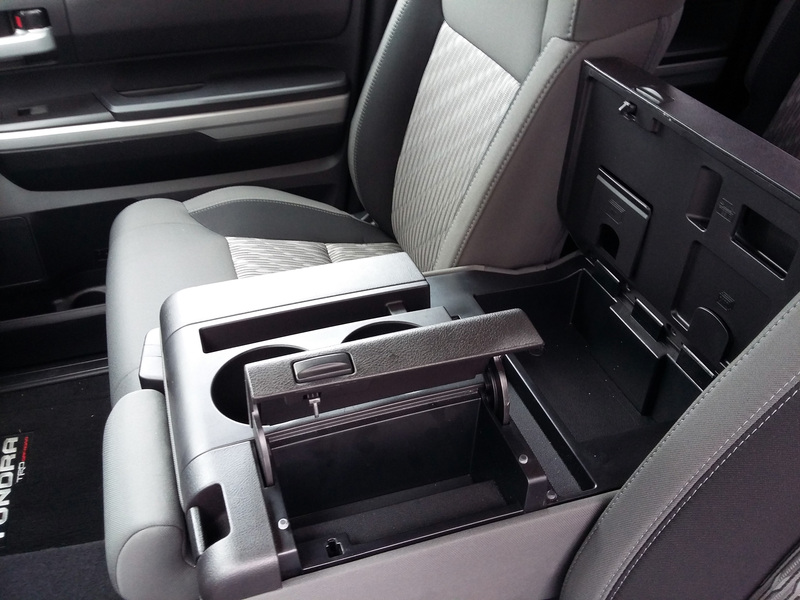 When folded down, the console box includes a pair of open cupholders and a narrow tray along with covered rear and side bins. Other storage areas include a small glovebox and large map pockets with cubholders in the doors. Lower the front-center seat back, and you have a console box with side and rear covered bins along with two cupholders and a storage slot. As this is the base-level Tundra, the interior isn’t as nicely finished as that of the Limited tested last year. But while the dashtop is hard plastic, the armrests are padded, as are the rear half of the door tops where front passengers would rest their elbows … so all the “touch points” are covered. 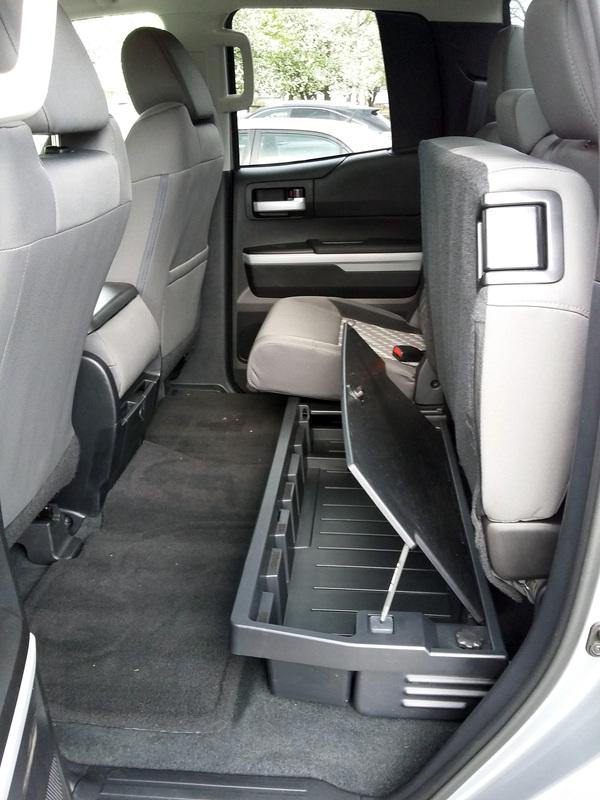 There is likewise a tall step-up into the rear-seat area, but although this was just an extended cab (not a crew cab), there is adequate adult legroom, even if the seat ahead is pushed far back, and also great headroom. A nearly flat floor allows decent center-seater space, making this a fairly practical 6-passenger vehicle. The cargo bed has a damped tailgate, but unlike some rivals, there’s no lower step (just the rather high top of the rear bumper) and no good hand grip to aid in climbing into it. The optional bed mat covered only the floor of the bed, not the inside of the tailgate, making for a “step” when trying to slide items from the tailgate into the bed. A flat floor in back provides a center-seater good room for their feet, and the cushions flip up to reveal covered storage bins. A high point of the Tundra is its powertrain. Not only does the 5.7-liter V8 provide a strong full-throttle jump off the line, but the transmission kicks down quickly for fine passing power when the throttle is stabbed from speed. Despite quite a bit of wheelspin on takeoff, we timed our Tundra at less than 6.7 seconds 0-60 in 2WD, an impressive showing. Activating 4-wheel drive eliminated the wheelspin, but slowed the time to just under seven seconds. Tundra only offers part-time 4WD that shouldn’t be left engaged on dry pavement; some competitors offer both part-and full-time systems, the latter far more convenient as it doesn’t have to be deactivated on dry pavement. In a long stint of 75 percent highway driving, the Tundra returned 16.1 mpg; overall, in 45 percent city driving, we averaged 14.9 mpg. Neither is great for a large pickup, even one with a V8 engine. Like most big pickups, the Tundra doesn’t fare that well over bumps, at least not compared to a car or crossover. Blame the separate frame – which can vibrate like a tuning fork over potholes – the antiquated (but almost universally used) leaf-spring rear suspension, the stiffness of that suspension necessitated by the need to carry heavy loads, and the hefty tires that come as part of the TRD Off-Road Package. Handling feels a bit ponderous, though that, too, sort of comes with the territory. The tall front end (which hinders front-corner visibility), large overall size, and wide turning radius also make the Tundra – as well as all other large pickups – tough to maneuver in tight spaces. While the rival Ford F-150 and Nissan Titan were redesigned for 2015 and 2016, respectively, and redesigned versions of the Chevrolet Silverado/GMC Sierra and Ram 1500 will arrive shortly as 2019 models, the Tundra was last redesigned for 2007. That shows in some areas such as cargo-bed features (a focus of most newer models), no available full-time 4WD system, and the lack of high-mpg powertrains. But the Tundra remains a viable offering in the class on the strength of its strong performance, practical general design, and good value for the money. And let’s not forget that Toyota badge …. Although the thick rear roof pillars don’t do much for visibility, the angled rear window affords the Tundra a somewhat sporty profile. 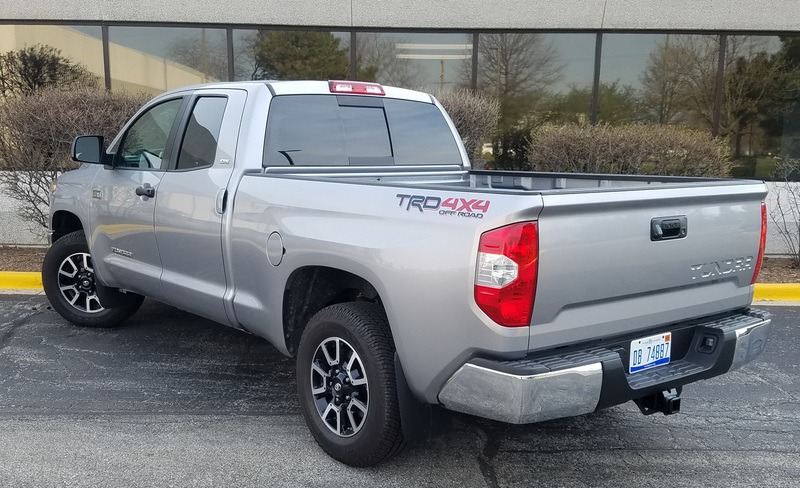 This Double Cab short bed is the smallest Tundra offered, as there’s no regular-cab model, but there are long-bed and crew-cab versions. Written by: The Daily Drive staff on May 22, 2018.